In 1999, my elementary school got every single kid to love computer class with a single move: It replaced a fleet of Macintosh Classic IIs with iMac G3s. The candy-colored shells, bright graphics and whimsical shape made it feel like you were spending time with some hip, space-age machine. Computing was so in that year. The G3 bas been discontinued for a decade, but it is still an icon of the optimism of the computing industry in the 1990s. 3D printers are going through a similar phase right now, as machine after machine hits the market. While they haven’t quite hit the ease-of-use of a 1990s era computer, they’re certainly getting there. We won’t know until Robox starts shipping to backers next month if it’s true the Robox is the printer people will want to have in their homes, but it does have some features that will make it more appealing. Most importantly, it has two print heads that behave differently: One prints tiny lines for a smooth, detailed finish, while the other prints a higher volume of plastic at a faster rate, lowering the time it takes to print an item. Elsworthy said a print job that would normally take three hours might take two, or even one, instead. The Robox also doesn’t ooze out extra bits of melted plastic, which quickly gets annoying when you’re trying to print a high-quality piece. The print head can be removed and replaced with other tools. Right now, users would have to use their imagination and DIY skills for that, but Elsworthy said he foresees people attaching 3D scanners, low-power laser cutters or even nozzles that print icing on cakes. Elsworthy said CEL, the small product design and development company behind the Robox, was cautious to only promise Kickstarter backers what they can deliver. They offered no stretch goals and launched the Kickstarter late in the printer development process. Pirate3D’s Buccaneer printer (the MacBook Pro of the 3D printing world) recently suffered serious backlash after delivery was pushed back and prototypes indicated the machine might not live up to what was advertised. Elsworthy said the company is building the first printers promised to backers this month. 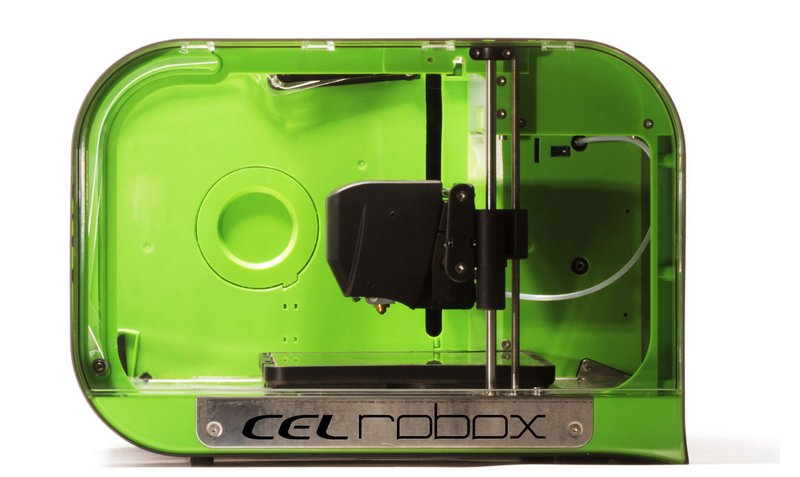 CEL will do a full launch to the public in early 2014, at which point the printer will be available for just less than $1,400. So we can look forward to non standard overpriced power cables that included electronics so no other company can supply you with one at a reasonable price. All 3D designs will need to be vetted by the company before you can share them. The plastic feed will be an incompatible size and shape to every one else, 2 x the price and will be patented. So if a firm tries and supply’s an alternative they get sued. But no worries it has a nice shiny case and that’s all that matters. They hope to do for 3d printing what the iMac did for computing? You mean rip people off? Don’t get me wrong I think this project is great, but it’s still way too nerdy to become the iMac of 3-d printers. Look at the huge ugly sign on the side, look at the ugly ports and look at the fact that it’s the “lead engineer” doing the presentation. They are going to get sued. They are clearly violated one of SSYS’ patents. I’m happy to see this, keep up the good work, etc. But you know, it wasn’t just the prettiness of the iMac that made it so popular. It was also, crucially, the ease-of-use of Mac OS and the applications available for it. In general, software for 3D-printing projects is a long way from Apple-grade prettiness and ease-of-use (as I recall, Ms. Brewster, you’ve written about this situation yourself). To sell millions of these things, Robox is going to have to pay at least as much attention to software as hardware.